2014 Victorian C/L State Championships. 4 days of ‘world class’ competition across the Easter holiday break, pictures, reports and results below. The hoped for perfect Easter weather was somewhat elusive. However, all events were flown over the four-day holiday break. Rain delayed the start on Friday and it was decided F2F would be first away. Six teams lined up for some spirited racing. Trent McDermott from Queensland was defending the title he won last year, this time teaming up with Murray Wilson. Their Nelson was really howling in a new model built by Norm Kirton over in the west. With Trent’s good landings and Murray’s super fast stops, they recorded a 3.57.82 heat and followed it up with a win in the 200 lap final in the very smart time of 7.46.60. It was an easy win in the end as the other teams both retired at a little over the halfway mark due to a ‘racing incident’ on landing. Of the other teams, Richard Justic and Paul Stein had a best of 4.11.44 with a Vorobiev. Ryan Leknys and Julian Reichardt were hot on their heels with a 4.14.72 and Grant Potter and Ray Harvey just missed the final with a best of 4.18.28 for the 100 laps. It was then time for the serious stuff….F2C. Eight teams ensured a good contest. The standout heat time was a smokin’ third round 2.57.53 by Murray Wilson and Mark Poschkens. Times like that will give them a big boost in confidence for the upcoming World Championships in Poland. Rob Fitzgerald and Mark Ellins are understandably saving their good gear for the Worlds, which is now only a few months away. They also had to deal with a nasty cut on pitman Mark Ellin’s hand that compromised his usual faultless catching. So the heat times were not up to their usual lofty standards. However, in the final this amazing team got it all together to run out easy winners in 6.11.48 from Murray and Mark in 6.39.90. Grant Potter and Ray Harvey made the final with a smart 3.11 but had to withdraw with a broken leading edge. Colin Ray and Steve Walton jumped in and were going well until the first stop when a missed catch put paid to their chances. Of the others, Ryan Leknys and Julian Reichardt had good airspeed and were getting much better starts while Paul Stein and Ric Justic were a little off their usual pace. The New Zealanders, Graeme Christie and Roger Palmer, gained lots more experience as they prepared to represent their country in Poland. Harry Bailey and Ken Hunting were hoping for a Stephen Bradbury moment where all the leaders fell over… and slow and steady triumphs! Unfortunately for them, nothing like that happened at Frankston this Easter. Classic FAI was next…and this is an event where Harry and Ken didn’t need any favours from the others! 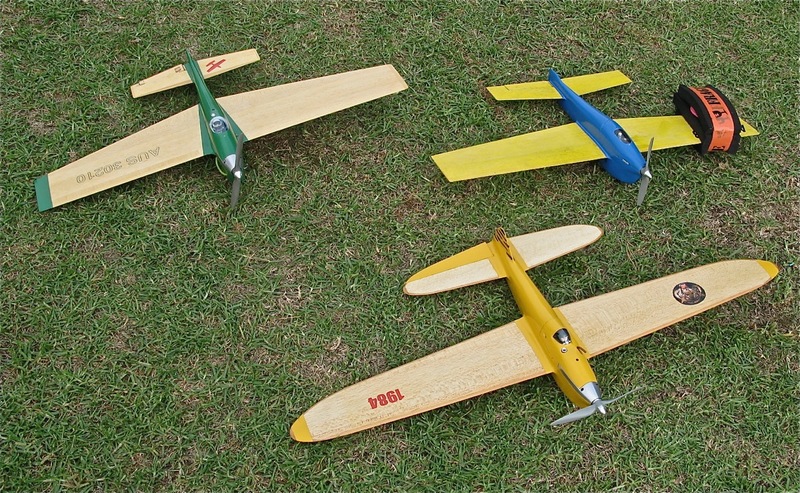 Their beautifully finished AAC Parra powered Klotznorutski racer was very capable of winning on its own. Their best heat time was 4.32.16 but the setup should easily do a sub 3.20. Murray Wilson and Mark Poschkens did exactly that with a quick 4.19.94. After a compression adjustment on the AAC Parra (about ¾’s of a bee’s whathesaid) for the second round, John Hallowell and Richard Justic posted a 4.19.97 in hardworking CD Graeme Wilson’s notebook. That’s just 3/100th of a second away from a coin flip for pole position in the final. Andrew Nugent and Mark Ellins again found that lacking a competitive engine with decent fits was too big a hurdle to overcome and they could only manage a best of 4.37.00 using their old Picus model and For a engine. We are all very much looking forward to a supply of new engines! Rob Fitzgerald and Paul Stein are usually right there at the business end, but strangely the usual fast times for the Concours winning Epsadon weren’t forthcoming at the 2014 V.S.C. Trent McDermott and Neil Baker practiced well but could not get a setting on the Fora when the heats started. Adam Kobelt is improving his piloting race craft with every flight and Ron Lacey is getting back to his best as he quietly slips into the role of becoming a gun pitman again. Ron was using an old modified Nelson model with a new Fora up front. Colin Ray was filling in for ‘Big Thommo’ and flying for Steve Walton. Although a fast time proved elusive today, Steve’s neat Fora powered racer has heaps of potential and a breakthrough to a major final is not far away. The final proved to be a battle between outright speed and consistency. Harry’s ultra lightweight Klotzorutskis and Murray’s Ron Wilson inspired model were up against the conventional weight Tiger flown by John and Ric. The Tiger won the Nats just a few months ago and was looking for the Victorian State title as well. Andrew Nugent commented that the yellow Tiger was like a ‘washing machine’. Just turn it on, the settings are there and it always runs the same way…. That’s a good way to illustrate the story! Ric rarely took more than a flick to start the AAC Parra and it just did it’s job, going round and round with a near perfect tune until the hand went up for a conventional one lap shut down. On the other hand, Murray and Posh showed bursts of speed while fighting an inconsistent setting. They had ½ lap or shorter shutdowns and were rapidly gaining time. Unfortunately for them, they were also short on range and an extra stop meant little chance of upsetting the yellow Tiger. Harry and Ken’s flight also had its up and downs. On song, they were probably the fastest of all, but the Parra wouldn’t stay like that for the entire 200 laps. So John and Ric followed up their Nats win with a V.S.C. victory in 8.50.72, just in front of Murray and Poshy on 8.55.63. Harry and Ken were third on 9.29.69. All in all, the State’s big dance for Classic FAI at Frankston saw lots of top racing from the entry of eight teams. Next race is scheduled for Albury on the 17-18th May. Super Sunday at Knox began with Vintage A. The overcast conditions were good to fly in. At least the rain had cleared for a while. The first heat saw Andrew Nugent and John Hallowell post a 3.20.38 to just pip the Cosmic Ray’s on 3.22.53. Both teams were disappointed as they knew a time in the teens was necessary to have any chance of making to top three. So John and Andrew finished in forth place and Colin and Jim made 5th. The second heat proved that point as Murray Wilson and Neil Baker did a 3.14.59 and Trent McDermott and Mark Ellins recorded a 3.15.44. This team backed up in the second round with a 3.15.01. That’s top consistency! Highlight of the day was no doubt the eyebrow raising effort of Harry Bailey and Ken Hunting. The Olympian was going fast and sounding great with the R250 swinging a Graupner 7×7 Speed prop. A stunning 3.12 FTD was the result. Perennial finalists Rob Fitzgerald and Paul Stein had a DNF 44 in the first round and withdrew with equipment problems. This left the door open for another team to be one of the three fastest qualifiers. A lot was expected from the multi talented team of Grant Potter and Ray Harvey. A fuel feed problem saw them retire without troubling the timekeepers for a full heat. The final was a beauty and any of the three teams could have been declared the winner. All were evenly matched for airspeed. Last year’s winners Wilson/Baker missed a kangaroo catch with the Olympian and lost time while both McDermott/Ellins and Bailey ran out of fuel with only a few laps to go and had to do an extra pit stop! In the end, the slipped catch cost less time than the extra pit stop. Murray and Neil were home first again in 7.00.40 ahead of McDermott/Ellins in 7.05.09 and Bailey/Hunting on 7.07.69. Next up at Knox was Classic B. Just six teams fronted for the race under the watchful eye of CD Keith Baddock. Last years winner Queenslander Trent McDermott again had the 2010 World Champion pitman Mark Ellins at the oily end of the lines. However, after some promising practice flights, their day started badly when a plug blew late in the warm up. A second round 3.12 was never going to be fast enough at the Vic State Champs. Last year with the same model they did a best heat of 3.00.00. Harry Bailey and Ken Hunting were, as usual, right in the mix to take the title. The Irvine 25/Galaxie combination surprised no one with a smart 2.59.85 heat. Jim and Colin Ray missed out on the final last year by 7/100th of a second… The practice form was good with the Crescendo and OS 25FX circulating fast with plenty of laps. But when the time came to race, the quick re-starts suddenly disappeared. Could it be next year for the Cosmic Rays? Grant Potter was flying Steve Walton’s great looking racer, but there were still a few things that needed sorting before posting a time of under three minutes for the 70 lap heat. Ric Justic was on the handle for Paul Stein. The grey OS FX Rocket has amazing airspeed and this was reflected in their first round time of 2.51.28 which is the second fastest heat time ever behind their 2.50.60 in South Australia last month. John Hallowell and Murray Wilson did a 3.00.46 heat that was good enough to put them into the top three. John and Murray’s race plan went like clockwork with Murray’s mighty flick and with Andrew Nugent on battery, they made two slick stops in the 140 lap final. Ric and Paul had ground handling issues and one slow stop. Harry and Ken had to make an extra stop with the Irvine and that put them squarely behind the 8 ball. In the end, it was a relatively easy victory with John and Murray finishing on 6.02.44 almost half a minute ahead of the other two teams. 27 Goodyear was run at the State Champs for the first time. Just 5 teams came to play…back it in for at least 10 next year. Trent McDermott wasn’t feeling the best and decided to leave early to head back to Queensland and that would have made it an even half dozen. Fastest qualifiers were Graeme and Murray Wilson using a Nelson to record 5.16.50. Adam Kobelt and Rob Owen had wandered over from the combat circle to have a go… and they did rather well to post a 5.17.47. Rob, of course has been pitting almost forever, but Adam is new to race flying and this highly skilled combat ace is taking to it like a duck to water! Third fastest were John Hallowell and Andrew Nugent with their bright blue Mr D and R250 swinging an 8×5 APC. Airspeed was close to the mark with high 27’s and low 28’s for ten laps. Remember, if you go under 27/10, even by 1/10 second, the Speed Police will immediately call you in for an extra pitstop. Kobelt/Owen won the final in fine style in 11.01.25 with over half a minute’s daylight to Wilson/Wilson. Hallowell/Nugent had problems during the race. They never recovered and finished third. It was probably the most fun of any of the VSC events. Paul Stein has promised to finish his 27 Goodyear by Albury, so we’ll have even closer racing very soon. Bet it’s fast and battleship grey! And here is an observation. It would be really good if all lap counter/timekeepers would take it upon themselves and call out “model coming in’ if the pitman is busy and entirely focused on re-starting his engine. This particularly applies to this event that we have many inexperienced people flying and pitting. A HUGE thank you to all the CDs, particularly Graeme Wilson and Keith Baddock. Both worked tirelessly to run the racing events. Here’s to next year!